After a large stroke, motor skills barely improve, even with rehabilitation. An experiment conducted on rats demonstrates that a course of therapy combining the stimulation of nerve fiber growth with drugs and motor training can be successful. The key, however, is the correct sequence: Paralyzed animals only make an almost complete recovery if the training is delayed until after the growth promoting drugs have been administered, as researchers from the University of Zurich, ETH Zurich and the University of Heidelberg reveal. Only if the timing, dosage and kind of rehabilitation are right can motor functions make an almost full recovery after a large stroke. Rats that were paralyzed down one side by a stroke almost managed to regain their motor functions fully if they were given the ideal combination of rehabilitative training and substances that boosted the growth of nerve fibers. Anatomical studies confirmed the importance of the right rehabilitation schedule: Depending on the therapeutic design, different patterns of new nerve fibers that sprouted into the cervical spinal cord from the healthy part of the brain and thus aid functional recovery to varying degrees were apparent. The study conducted by an interdisciplinary team headed by Professor Martin Schwab from the Brain Research Institute at the University of Zurich and ETH Zurich’s Neuroscience Center is another milestone in research on the repair of brain and spinal cord injuries. 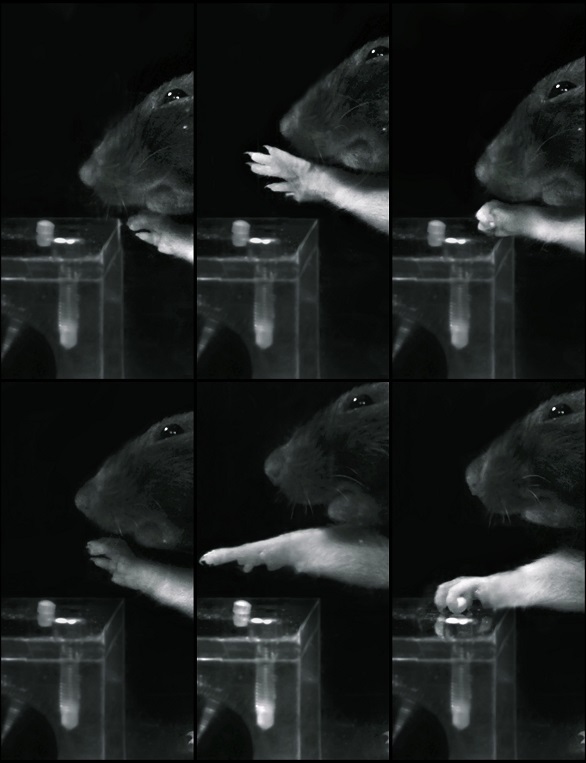 “This new rehabilitative approach at least triggered an astonishing recovery of the motor skills in rats, which may become important for the treatment of stroke patients in the future,” says first author Anna-Sophia Wahl. At present, patients have to deal with often severe motor-function, language and vision problems, and their quality of life is often heavily affected. On the one hand, the treatment of rats after a stroke involves specific immune therapy, where so-called Nogo proteins are blocked with antibodies. These proteins in the tissue around the nerve fibers inhibit nerve-fiber growth. If they are blocked, nerve fibers begin to sprout in the injured sections of the brain and spinal cord and relay nerve impulses again. On the other hand, the stroke animals, whose front legs were paralyzed, underwent physical training – namely, gripping food pellets. All the rats received antibody treatment first to boost nerve-fiber growth and – either at the same time or only afterwards – motor training. The results are surprising: The animals that began their training later regained a remarkable 85 percent of their original motor skills. For the rats that were trained straight after the stroke in parallel with the growth-enhancing antibodies, however, it was a different story: At 15 percent, their physical performance in the grip test remained very low. The researchers consider timing a crucial factor for the success of the rehabilitation: An early application of growth stimulators – such as antibodies against the protein Nogo-A – triggers an increased sprouting and growth of nerve fibers. The subsequent training is essential to sift out and stabilize the key neural circuits for the recovery of the motor functions. For instance, an automatic, computer-based analysis of the anatomical data from the imaging revealed that new fibers in the spinal cord sprouted in another pattern depending on the course of treatment. By reversibly deactivating the new nerve fibers that grow, the neurobiologists were ultimately able to demonstrate for the first time that a group of these fibers is essential for the recovery of the motor function observed: Nerve fibers that grew into the spinal cord from the intact front half of the brain – changing sides – can reconnect the spinal cord circuits of the rats’ paralyzed limbs to the brain, enabling the animals to grip again. “Our study reveals how important a meticulous therapeutic design is for the most successful rehabilitation possible,” sums up study head Martin Schwab. “The brain has enormous potential for the reorganization and reestablishment of its functions. With the right therapies at the right time, this can be increased in a targeted fashion.